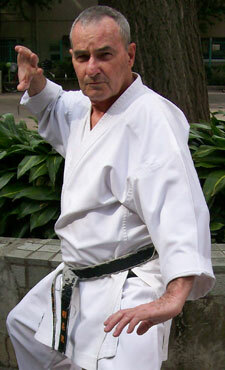 Principal Instructor/Head of Style, for Shúshin Kai Goju-Ryu Karatedo. Graeme McConnell-Brown trained as a Physical Education teacher before joining Ansett Australia, a major (but now defunct) Australian airline. He spent most of his 28 years with the airline in training, management development and human resource management positions in Melbourne, Victoria. For the last six years he was the company’s senior training & development executive. During this time he also worked as a training consultant for the Australian Institute of Management, conducting public training programs in the areas of human resource management, personal development, general management and organisational development. He also conducted training in human behaviour and motivation for many years at the Victoria Police Academy. Graeme began training in the martial arts in the Gojukensha style headed by Sensei Ohtsuka, a senior student of Sensei Ichikawa. The local instructors of the style broke away from the Gojukensha school and for a time were without a master. In 1983 they were to associate with Sensei Watanabe, a student of Masashi Sudo, (also a senior student of Sensei Ichikawa), who was living in Sydney, Australia. Between 2005 and 2009 Shushin Kai trained with Kyoshi James Sumarac, 7th Dan, Principal Instructor of Goju-Ryu Karate-do Kakurin-Kan, formerly Gojukensha. In 2009, following a visit to Japan, Graeme was accepted as a member of Ichikawa-ha Goju-Ryu Karate-do Sosui-kai, under the instruction of Tsubamoto Sensei, (10th Dan). He firmly believes high level skills, and maturity, in years; as well in life experiences are crucial for a teacher of the martial arts. He urges any potential student of the martial arts to look for these qualities in their future teacher. Graeme also puts a great deal of emphasis on the spiritual and philosophical aspects of the martial arts. This is most important for students who look for more than pure fighting skills from their karate study.